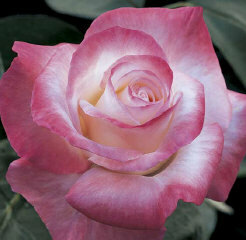 Francis Meilland® is a tall Hybrid Tea rose with a very large bloom, good exhibition form and strong fragrance. It is a multiple award winner in Europe for disease resistance as well as esthetics. 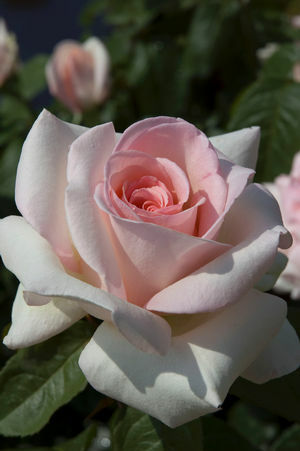 It is one of the first Hybrid Tea roses to win the prestigious ADR contest in Germany. 2013 AARS winner. This remarkable rose bears the name of a remarkable rose breeder, in honor of his 100th birthday. My friend, Chris, The Redneck Rosarian, says this rose grew to about 9ft in his garden last year. Wo…. Now the big decision is where to plant the two I purchased from Edmunds! Tall, disease resistance, beautiful fragrance and beautiful form … I can practically see a ribbon on my entry! The picture of this rose in the Edmunds catalog plus all the raves from those who grow this rose made it very difficult to resist. Creamy white with a coral edge on perfectly formed blooms. You won’t have to look at your horoscope to see if you are a winner with this rose as every flower seems to have perfect form. Its color will intensify as it ages and you will find it with long cutting stems and terrific dark green leaves to offset the flowers. Gemini signifies twins so you will probably want to buy it in quanities of two. A must have for all exhibitors. It wins often. I ask you, could you resist?? This time of year hope springs eternal and all of us rose gardeners “know” that this will be the year. Any “issues” from last year have been forgotten and this year, well, it’s gonna be special… no more than a touch of blackspot, no drought, no thrips and certainly no more than a couple of Japanese Beetles. Add to that — big luscious blooms that the judges just can’t pass by! I have a few more roses on my list that I’ll share a little later. In the meantime, do you have any exhibition quality roses, you think I might “need”? Please share. 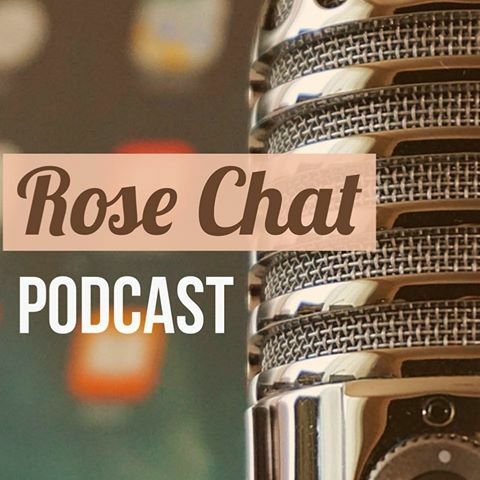 And, if you are a “rose exhibitionist,” please leave me at least one tip. Not a rose exhibitionist, but good luck. You sure brought the Ravens good luck!! I also ordered two Francis Meilland’s…9 feet ..oh dear! I guess I will have to rethink my planting location as well. Gemini is one of my favorites . Hybrid tea ‘Moonstone’ and Miniature rose ‘Bees Knees’ I’m told are excellent exhibition roses. Congrats on taking the plunge! Bees Knees is a great recommendation. Thx! Good luck to you too! Francis Meilland is gonna be a show stopper for sure! I think you are on the right path with Gemini. Good luck! This blog brings back wonderful memories for me. My mother loved roses and had beautiful rose gardens. Ahhhh so glad to evoke the good memories of your mom! Have a wonderful day.